Car seat restoration is one of the priority areas of the Tallinn tuning shop Saleks Grupp OÜ. With Saleks Grupp, you can be sure that the new design of your car seats is limited only by your imagination. We are ready to quickly and efficiently implement your unique idea for car seat re-upholstery. 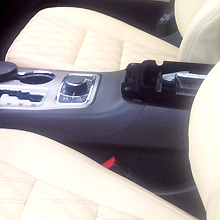 Car seat refurbishment is always in demand among other vehicle interior services in Tallinn, Estonia and worldwide. Just like the steering wheel, car seats are a huge part of driving comfortably. The driver and passengers will appreciate the increased level of ergonomics and comfort inside a car with newly upholstered seats. 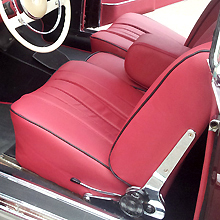 Compared to buying new seats, full or partial re-upholstery is much more cost-efficient for eliminating any defects caused by wear and tear, sunlight, cigarette burns and liquid spills. Compared to buying seat covers, reupholstering can eliminate a wider range of defects and return it to the original condition (and even improve it). Going the DIY route often proves to be too complicated. Steps of the process include: partial or complete disassembly, careful planning, selecting optimal materials, marking, cutting, gluing, stitching, stretching and positioning the cover on the frame, and drying and steaming the parts. Professional car seat restoration will correct all defects fast, easy, and affordably, no matter how faded, worn and torn the seats are. Tallinn auto interior repair shop Saleks Grupp OÜ boasts of an individual approach to each customer. Let our skilled craftsmen turn your seats into a masterpiece. Inexpensive cars will start to look more distinguished, while luxurious and vintage cars will start to shine with their seats redone. Any auto can become more comfortable for long trips with its seats repaired and reupholstered. Our company uses only the highest quality material and does prompt and quality repair. We can help you develop an individual project based on your preferences in the shape and design, including the ideal materials, style, color, texture, and stitching. Car make and model is not a restriction, and only the owner’s imagination will define the end result of this new design masterpiece.